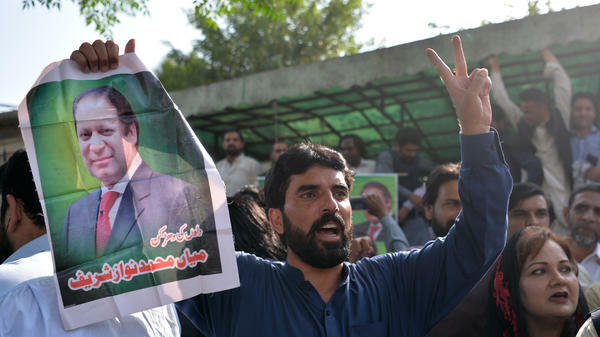 Pakistani supporters of ousted Prime Minister Nawaz Sharif carry posters and banners outside the high court building in Islamabad on Wednesday as they celebrate his release from prison. Sharif is appealing the conviction, which followed a major corruption scandal. On Wednesday, Islamabad's high court ordered him released on bail as his appeal moves forward. "Soon after the news spread, supporters of the former prime minister and his daughter Mariam Nawaz danced in the streets, distributed sweets and chanted slogans," NPR's Diaa Hadid reports from Karachi. Sharif was briefly released from prison earlier this month to attend the funeral of his wife, Kulsoom Nawaz, who died of cancer in London and was buried in Lahore. "The Sharif family has shown no indication they intend to accept the sentences. They have previously said they would appeal any convictions. "Throughout the case, they and their political supporters have cast the allegations as part of a campaign to discredit the former premier — allegedly led by Pakistan's army, which has made little secret of its dislike for Sharif. The longtime politician's first two terms in power ended abruptly under military pressure, the second time by outright coup." Sharif received a 10-year sentence, while his daughter Maryam was sentenced to seven years and her husband, Mohammad Safdar Awan, was sentenced to one year in prison. They deny all wrongdoing. Nawaz Sharif has also been banned from public office for life. "The prosecutors in the case, the National Accountability Bureau, said they would appeal Wednesday's ruling and take the case against Sharif to the country's Supreme Court. "Following the decision on Sharif, his supporters rushed to the court in jubilation, chanting pro-Sharif slogans, waving banners and posters of the ex-premier.
" 'This is a triumph of justice,' said Sharif ally and former Foreign Minister Khawaja Asif, who was outside the court. "Another supporter in the crowd, Naveed Abbasi, said he is convinced Sharif was a victim of conspiracy but that, 'God willing, the people will make Nawaz Sharif again the prime minister ... for a record fourth time.' "
Reuters reports that Pakistan's ruling party, PTI, says the case against Sharif will continue moving forward.